Leading Manufacturer of soil analyzer from Ambala. Advanced Technocracy Inc. is Manufacturer, Exporter & Supplier of Soil Analyzer. 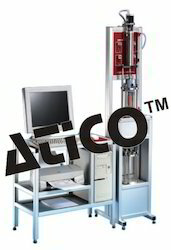 The triaxial loading frame is designed as a stand unit in which the mechanic, pneumatic as well as the necessary electronic interface to the computer have been installed. The loadding frame is available in three embodiments: As a pneumatic press (Load control ) As a motorized press (path control ) As a pneumatic and motorized press (Load and path control) Features : Special fully electronic pneumatic valves equipped with a separate digital display are provided for this purpose; these valves also exercise a safety function independent of the process computer. A fully electronic burette is used to measure the water volume during a triaxial test. The water level in the burette can be read optically at any time. The built in micro-vacuum pump with its digital display shows the existing underpressure when the entire system is deaederater. A special Pw. transducer is used to measure pore-water tension. This transducer is connected directly to the soil sample by a drainage line. Special stainless steel fast release couplings are provided for the connection between triaxial cell water container, pneumatic valves and vacuum. Looking for Advanced Soil Mechanics ?